In the midst of the glider chaos of last week, we forgot to tell you something. 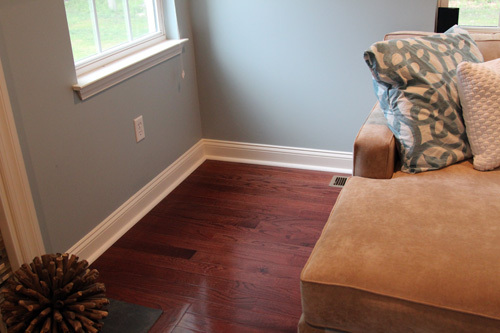 Not only did we decide to go with hardwood in our family room (we discussed the reasoning here), but it was delivered and installed. 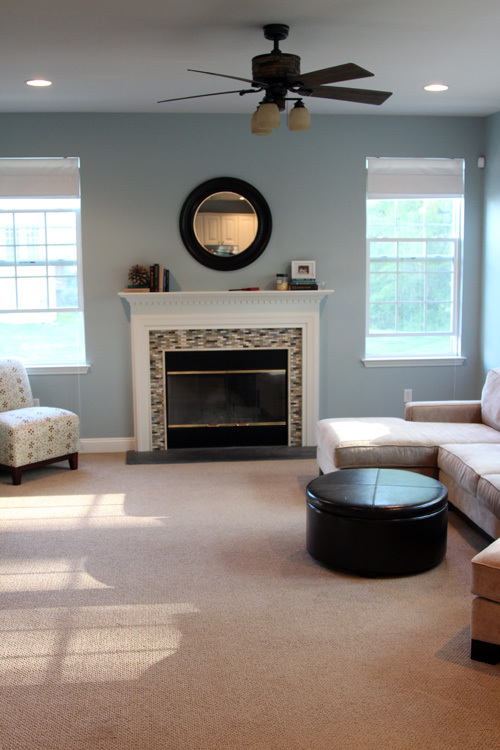 We didn’t have much time to flip flop on our decision and just decided that the carpet had to go… and quickly. We had stopped spending time in the family room because the cats follow us around the house and if we were in there, it meant Darwin was there, which meant an increased possibility of accidents. Plus, being 9 months pregnant and having to jump over SpotBot crop circles (as we called them) to get on to the couch was not a fun process. 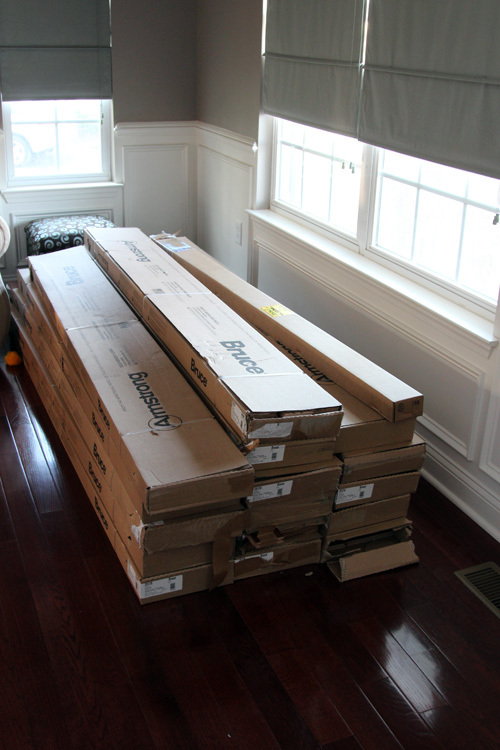 We scheduled our install about 2 weeks in advance and we could not wait until the day came. I was counting down the minutes until that carpet was gone and I told the baby that it could not come until that weight was off my shoulders. So on Friday, we said our final goodbye to our carpet. 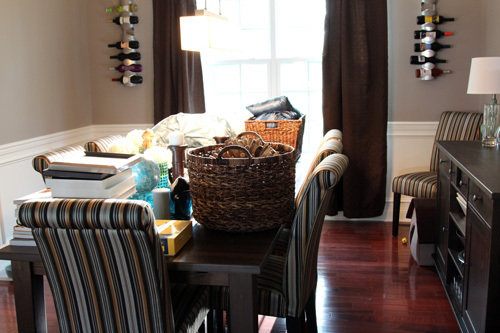 I was never in love with the idea of doing anything but carpet in this room. 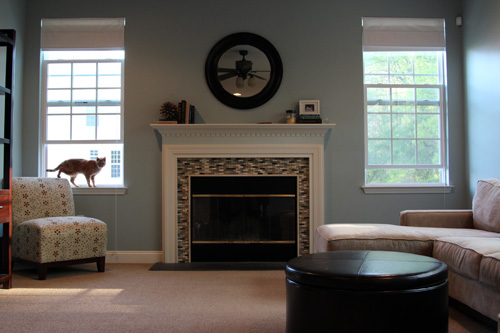 I liked our dark ottoman and dark entertainment center and thought the contrast of the carpet looked better. I accepted the hardwood as more of a necessity. 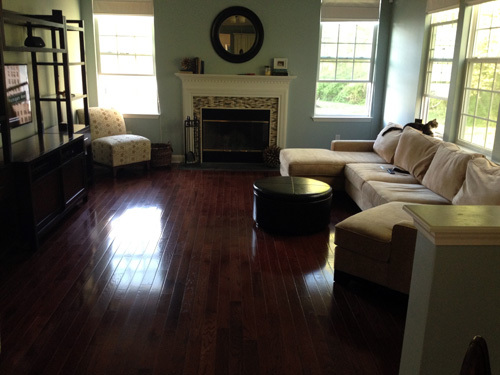 One of our concerns was that the new floors would not match the existing floors, since they were installed over a year apart. But much to our surprise, they match perfectly. 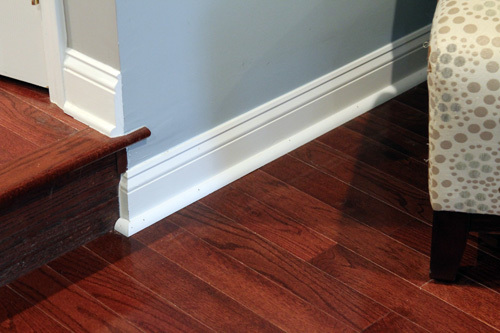 With the hardwoods, we also had to add an additional quarter round piece of molding. By we, I mean our contractor. We didn’t do these floors on our own! We had to move everything off our of entertainment center so that it could be easily moved for the install… I still haven’t put it back. 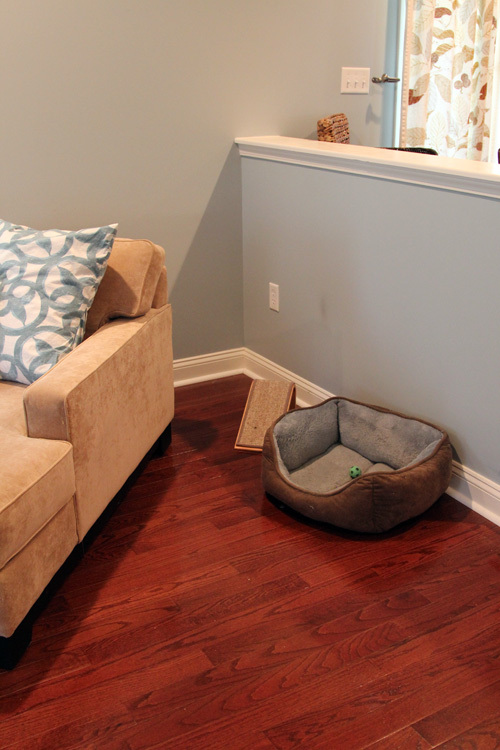 The lack of clutter isn’t going to last long, since we plan on dedicating this corner to a Pack ‘n Play. Don’t worry, we would never forget about our first babies. Macky will be keeping his corner of the family room. I haven’t brought their toy box back out yet (it’s just a wicker basket that they know stashes the toys) since I’m trying to enjoy the lack of stuff, but Macky’s bed was a necessity in the room. That guy LOVES his bed and will cry if it’s not around. 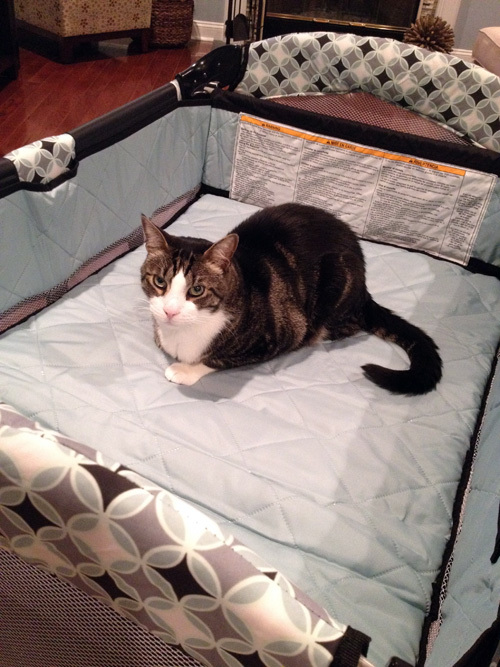 We think that to keep life as normal as possible for him when the baby comes, he needs to keep his little safe zone. He’s much more sensitive than Mowie or Darwin who adapt more easily and aren’t as attached to routines. We’re trying our best to make the baby transition easy for them. Maybe that’s another post for another day? Strangely, I think that my iPhone better captures the color of the floors. They’re still cherry, but not an orange cherry. 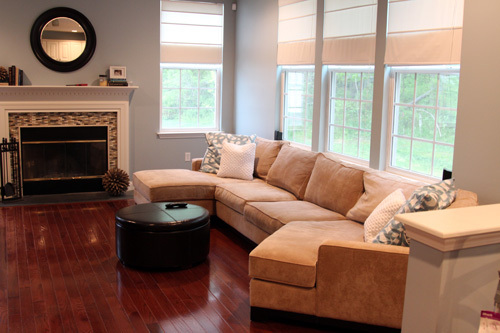 The ottoman and entertainment center mix in well with the darker spots on the floor. Now maybe you can see why we are so impressed with the new floors? Plus they seem to make the room appear larger, which is always a bonus! It looks great! I know you were hesitant to see the carpet go, but I think the wood looks awesome! I hope you’re feeling more relieved/relaxed, having found your glider and gotten the carpet situation taken care of! The floors look so great! I love your style. And good for you for just hiring someone to get it done! They came out great!! Good investment too. 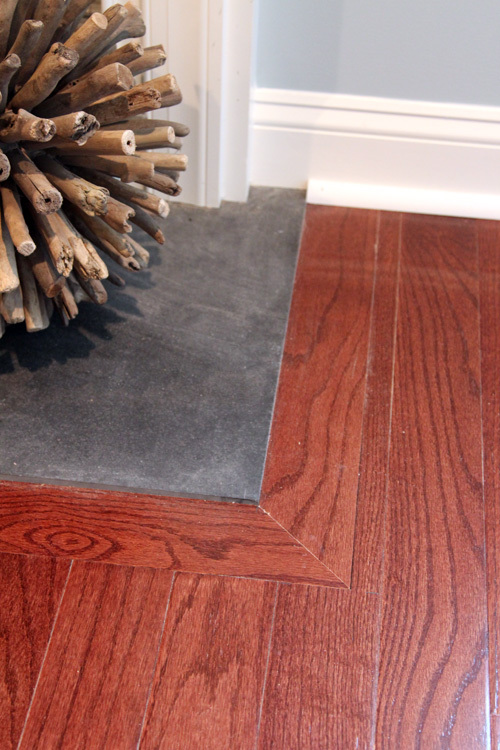 I’m digging the wood floors. I agree that they make the room look bigger! They look awesome! 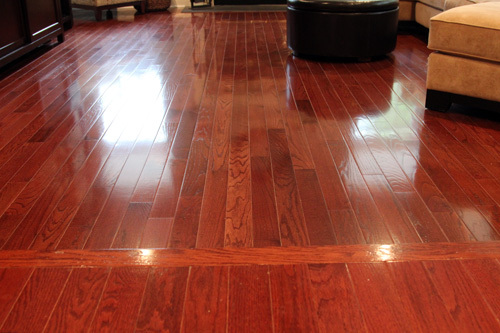 We have hardwood everywhere except in the kitchen and bathrooms and I love it. I’d have it everywhere if I could. Can I borrow your cat? I keep trying to convince the husband that our upstairs carpet has to go. We have this debate at least 3 times a week. I love your how living room looks!! 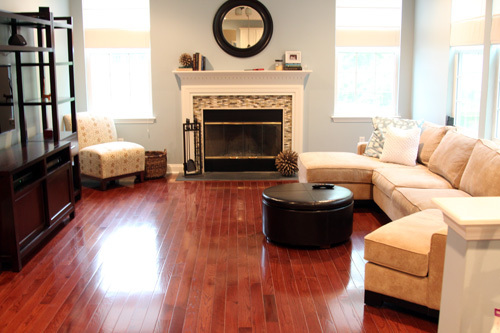 Your living room looks great with the hardwoods! How have things been with Darwin on the new floors? I meant to mention that in the post, but not a single accident since we tore up the carpet! Which I guess just proves that he smelled something on the carpet that made it impossible to break his habit. I have a slate fireplace and I treat it with liquid gold to make it black. The floors do look great. My husband and I also like your entertainment center. Would you mind sharing information on that as well? In advance, thank you! 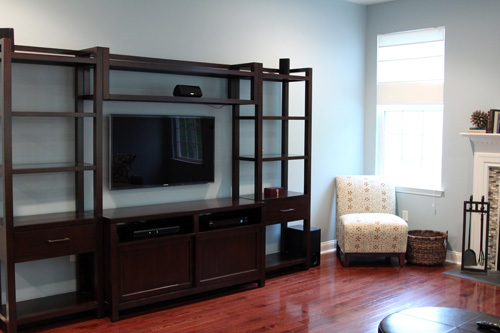 Hi Lauren, the entertainment center is from Crate & Barrel 2 years ago, but they still carry it. It’s the Tyler media center. I am reasonably certain I’ll be told plenty of new stuff proper right here!